The Mew Gull is a medium sized gull with a typical wingspan of 40 to 45 inches. 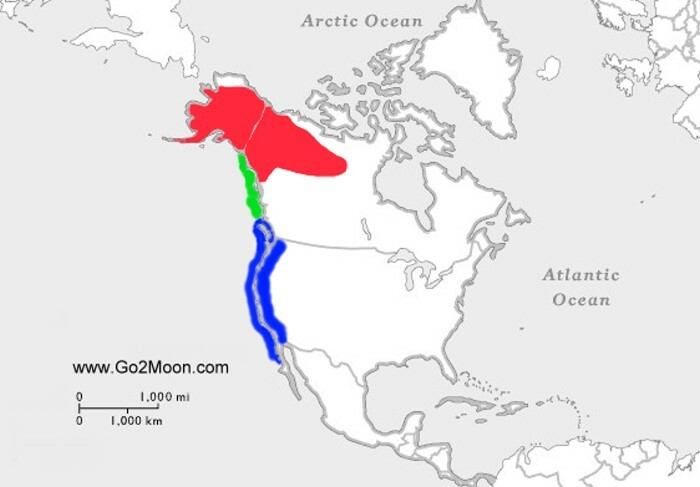 In late spring, they fly to Alaska and north-western Canada to their nesting grounds. See migration map (far right). During the breeding season, Mew Gulls have a white head, yellow bill, grey wings and a distinctive red orbital ring. In the winter, adults have a red spot on the lower part of the bill. Males and females have similar plumage, but the males are slightly larger. Females usually lay 2 to 3 olive colored eggs with brown blotches. Mewgull Art - Close up pictures of Mewgull eye and feathers as it grooms itself in the evening light. Feather details can be seen in these shots. With several eggs in the nest, it is not uncommon to see triplet chicks hanging out together in the marsh after the eggs have hatched. Below: Mew gull building a nest. The Mew Gull chicks are now out in full force and highly active outside of their nest in late spring. This year, the migrating birds such as the gulls were faced with an unusually late spring. After they arrive at their breeding grounds in Alaska, there is still some ice in the marsh. Seagulls are slightly bigger than Mew Gulls. Seagulls in flight, skimming just above the surface of the water before landing. Photos taken on the Kenai Peninsula in summer. Seagull hovering up and down, trying to intimidate a fellow bird. They are not even afraid to attack Bald Eagles. Hundreds of Mew Gulls crowd the waters of Potter Marsh every year. They nest and raise their chicks in Alaska during the summer. More pictures of the Mew Gulls or Seagulls in Alaska. Mew Gull poses for the photographer.